The north east region of the United States had an unusually mild winter. We were a bit concerned with the lack of snow, which would tend to very dry conditions. BUT.... the Father gave us another reason to give him praise. The weather conditions balanced out. We received the necessary rain and as an added bonus, the roses this year in our region are absolutely beautiful and abundant. My husband and two daughters enjoyed an early morning walk through a beautiful romantic garden. It reminded me of a song. And the melody that He gave to me, Within my heart is ringing." Spend time in the garden with Him. I AM having a Glorious day. 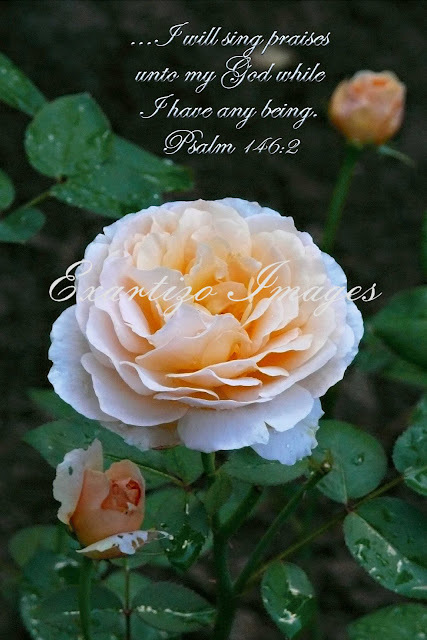 You have added to it by sharaing that excellent photo of the cream-colored-peach rose. Plus that song which I haven't heard since childhood; about 55 years ago for me. Tomorrow, when daylight returns, I will return to our garden. Thanks you for the inspiration. And thank you for the kind words on my "Walk With Father Nature" blog.